chocolate candy fishing bobber, chocolate candy pliers tool, chocolate candy fishing reel, chocolate candy fishing lure, chocolate candy pocket knife tool and gummy worms bait. 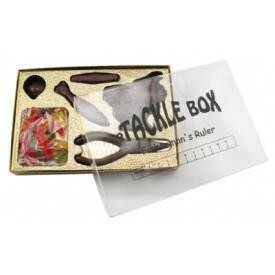 Packaged in clear fishing box and secured with stretch band ribbon. Great gift for Dad. Makes a great food gift or fishing event opener or father''s day gift.